We were at a used bookstore recently, and I treated myself to a copy of a book I knew was a classic, that indeed I had never read in school or been assigned to read: "The Catcher in the Rye." Why I should have wanted to read it at this particular time in life is somewhat of a mystery to me, since certainly I had always heard of the book, but never felt compelled to read it. I had read Nine Stories and remember being particularly moved by all the stories, particularly the unforgettable "A Perfect Day for Bananafish." I think this collection inspired me to start writing stories. In any case, I started Catcher just today and am impressed with both its directness and sincerity, not to mention how shocking it must have been in 1951 for the world to suddenly meet the rebellious and societally experimental Holden Caulfield. 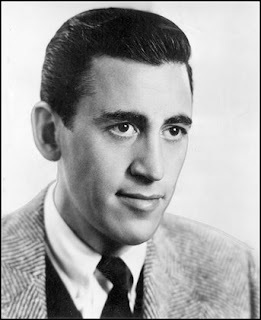 Curious about the book's background and JD Salinger, I did a bit of research and learned that the novel still sells 250,000 copies a year, and that the author is today known more as a recluse than anything else, although much has been written about him. What makes a literary success today or at any other period can sometime be mystery, and it seems like this book is such a mystery to a certain extent. In an excellent essay I discovered from The Washington Post that was written about 14 years ago, writer Jonathan Yardley states: "Viewed from the vantage point of half a century, the novel raises more questions than it answers. Why is a book about a spoiled rich kid kicked out of a fancy prep school so widely read by ordinary Americans, the overwhelming majority of whom have limited means and attend, or attended, public schools? Why is Holden Caulfield nearly universally seen as "a symbol of purity and sensitivity" (as "The Oxford Companion to American Literature" puts it) when he's merely self-regarding and callow? Why do English teachers, whose responsibility is to teach good writing, repeatedly and reflexively require students to read a book as badly written as this one?" I suspect I will have my own theories and conjectures once I finish the book, but my initial feeling is that readers love an honest voice, and at the very least, a voice that admits when he or she is lying. I think it makes us feel like someone is taking us into their confidences, maybe even trying to be our friend, not matter how crude or ugly the real world, or growing up, can get. Also, even at this early stage, it is easy to tell that despite all his flaws, Holden Caulfield is a genuine lost soul, and at the end of the day, haven't we all felt that way, whether we are 16, or 60?